Providing you the best range of mineoro-fg90 distance detector with effective & timely delivery. Model Substance detector FG90 - Fully electronic and one-piece. Hand Held. Net Weight 2,180 (two thousand one hundred and eighty grams). Detection system Biotronic Classifier System - BCS. 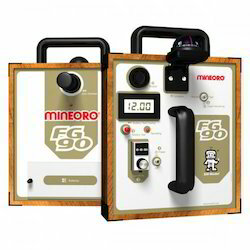 FG90 is MINEORO® most powerful Long Distance Detector, professional, capable of detecting long-buried treasures and also major concentration of gold in mines. Extremely advanced technology, and simplicity of use, makes it the most versatile and sensitive detector in the market nowadays. Accessories: Carrying case – Manual- Stand-support –-. Looking for Mineoro Metal Detectors ?